Penn Vet students will star in an upcoming reality television show on Animal Planet. As a child, you may have at one point dreamed of working with animals every day as a veterinarian. If that dream never panned out, however, a new show following one Philadelphia college's students will, at least, help you live out the profession vicariously. The University of Pennsylvania School of Veterinary Medicine (Penn Vet, for short) announced Wednesday its fourth-year students will be featured in a new reality television show on Animal Planet aptly titled "Penn Vet." PENN VET will feature students with diverse backgrounds and goals as they handle a wide range of cases, at both Ryan Hospital for companion animals, in Philadelphia, and New Bolton Center hospital for large animals in Kennett Square, PA. With the animal’s lives on the line, PENN VET showcases the rigorous training of veterinary students as they face the day-to-day challenges inherent in this high pressure world. 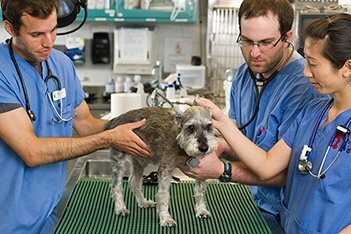 Penn Vet is considered one of the top veterinarian schools in the country. Rankings from U.S. News in 2015 placed the school at tied for seventh in the nation. But whether that prestige plays out as entertaining reality television remains to be seen. Surely, it should be more watchable than Philly's own "Saturday Morning Fever." If anything, it should be more intellectual as these people are training to be, well, doctors. "Penn Vet" will premiere sometime this year.